Consulting firm specializing in creating new revenue opportunities for companies in the consumer, technology, market research, and professional services industries. Privately held. Assist companies in developing strategy around the ability to grow revenue and deliver new clients to their organizations through a variety of methods. Focus on maximizing the efficiency of the sales and business development processes, organizational flow, third party relationships, partner opportunities, pricing, merchandising, and C-Level relationships with clients. Clients include Bragg Live Foods, Farmer John, Sofella Natural Foods, Golden Orchid, Packaging Specialists, Retail Solutions (formerly T3Ci), Rethinking Your Future, Image Orthopedic, SMG, Brand Equity Consulting and Jack Lalanne. Fortune 500 consumer product company. Overall revenue of $5B and group revenue of $400M. Reported to VP Sales. Responsible for strategy and execution of a start-up team for National Accounts; grew revenue from $15M to $100M. Nation's 19th largest Retained Executive Search Firm based on domestic revenue. Privately held, reported to CEO. Managed the business development activities of 18 consultants, (at various levels), who specialized in Consumer, Financial Services, Engineering, Light Manufacturing and Technology. Major Clients included Campbell's, Disney, Capital One, Yahoo, Visa, Real Networks, Washington Mutual and Network Solutions. Conducted senior level executive searches in numerous functions including CEO, COO, CFO and Board positions. Developed a strategy and growth initiative to increase annualized revenue by 17% in a down market with the loss of major financial services clients. Responsible for creating a communication strategy and model differentiating deliverables from competitors that sparked an increase in revenue from existing clientele and an acquisition of 10 new clients. Global consulting market research firm ($650M), and a leading supplier of consumer and analytic solutions to the CPG industry. Publicly held until 2004 then became privately held. Reported to EVP, GM. Responsible for revenues totaling $25M-25 full time employees-and 5 vice presidents as direct reports. Overall responsibilities included consulting, business process improvement, contract negotiation, servicing, support of branded and private label marketing and sales, and development and delivery of custom solutions. Client objective was to drive profitable revenue trough the enterprise. Retailers included Wal-Mart, Costco, Safeway, Kroger, Walgreen, Target, Whole Foods and Dollar Stores. 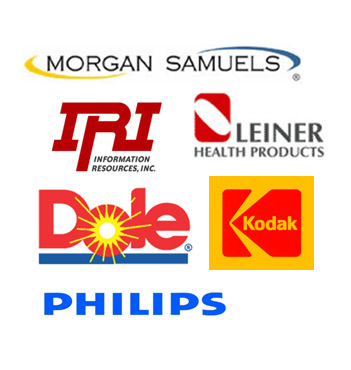 Clients included PepsiCo, Unilvever, Con Agra, American Greetings, H-P, Nestle, Microsoft, Acosta, Advantage and Daymon. Drove $50M+ in incremental profit during tenure by securing over 300 new clients to the enterprise. Exceeded revenue and profit plan for all areas of responsibility six of seven years overall. Started Business Development group in 2000 and exceeded target for six consecutive years. Mentored, nurtured and promoted six direct reports from Director to VP and one from VP to SVP. Awarded membership in IRI President's Club for outstanding achievement. Oversaw the Customer Interaction Center delivering data, solutions and analytics to 600 US based clients via the phone and web. Drove annual savings of $1M by off shoring multiple analyst positions to Bangalore, India. Grew call center revenue by 230% expanding existing clients penetration and grew overall maximum client servicing limit from $75K to $300K. Developed strategic alliances with all US based Sales and Marketing Agencies (Broker) clients. Spoke frequently at multiple industry trade functions. Career Track at IRI (2000-2007): promoted to SVP Bus Dev and Client Relations, Agoura Hills, CA(2005-07),promoted to SVP Bus Dev and Customer Interaction Center, Agoura Hills, CA(2001-2005), VP Business Development, Agoura Hills, CA(2000-2001). Managed 5 direct reports and 10 brokers. Multi-channel responsibility included Food, Drug, Mass, Club, Foodservice, and Exports. Strategic customers included Wal-Mart, Costco, Target, Kroger, Safeway, Ahold, Walgreen, Rite Aid, & Albertsons. Exceeded EBITDA goals by 10% for three years. Developed strategy, merchandising and category management plans. Focused on productive trade spending, optimal product mix, swells reduction, ECR, and heightened brand equity. Orchestrated overall Private Label Strategy. Partnered with Wal-Mart, Ahold and Costco. Integrated Private Label Strategy with brand business plans to align with strategic customers. Reduced partners from 15 to 7, while increasing EBIT by $2/case. Partnered with Wal-Mart on Fact Based Selling Initiative that made canned pineapple the "Category Driver" with displays driving sales by 80%+. Opened export distribution in Latin America exceeding 100,000 cases in 1998. Global Fortune 500 company with sales of $14B. Group sales of $1.5B. Reported to Executive Vice President, Sales and Marketing. Bottom line responsibility for Rite Aid the division's fourth largest customer generating $100M in revenue; managed $45M P&L and 30 employees. Directed a team of 5 and tripled Rite Aid processing revenues from $35M to $100M increasing merchandising displays, lowering pricing, and efficiently managing acquisition of Perry Drug. Grew overnight processing from $30M to $50M and onsite processing from $5 to $50M. Appointed Category Captain in 1995 via Top to Top relationships with Rite Aid/ Partnering Group. Other captains included Kraft, Coca-Cola, P & G and Nestle. Fortune 100 Corporation with global sales of $36B and group revenue of $10B focused in consumer and commercial audio visual products; reported to Executive Vice President, North American Sales. Hired 25 new sales people west of the Rockies to sell, market and promote CD-I; customers included Best Buy, CircuitCity and many regional specialty AV retailers. Led commercial sales of large screen color replay boards at stadiums, arena, amusement parks and other public venues in the US and Canada. Sold $2M-$5M systems to Meadowlands, Baltimore Aquarium, Crystal Cathedral and the University of Tennessee among others. Grew start up group from $15M to over $100M in only three years. Increased sales from $35M to $100M in under two years for supplier at large drug chain. One of four executives responsible for helping transform the Consumer Electronics Industry with the innovative, successful roll out of the nation's first DVD player. Created start up business development group that won over $50M in new clients. Led acquisition of a multi-national competitor to bring company to #1 player in category. Improved revenue by 17% in a professional services environment in less than a year. Greg Merfeld has over twenty years of leadership experience building and leading “best in class” sales teams for all sized companies. As an accomplished agent for change and an organizational strategist, his vision and expertise have driven notable results in the consumer products, technology, market research, professional services and consulting sectors. His specialty is driving profitable revenue and reducing cost. Greg offers a rare combination of creative, strategic and analytic strengths matched with strong financial acumen. He has converted opportunities into successes at multiple enterprises and has restructured and turned around entities within numerous organizations. Greg is regarded as a high-energy take charge executive quick to step into an organization and generate improved results. These skills are reflected in his work at IRI, Leiner, Dole, Kodak, Philips and Morgan Samuels where strong results have been in evidence. Decisive executive who brings strong experience in driving client value across complex environments. Deliver end to end positive results as both an individual contributor and team leader to all sized private and publicly-held companies. Expert in the development of start-up groups within larger organizations that exceed organizational objectives. Skilled in translating vision into plan within business process improvement environments. Excellent relationships with clients from F500 companies and adept at working cross functionally with both internal and external constituencies to drive value and ROI.